Funny woman and author, Robin O’Bryant is in town this week for the Nashville leg of her book tour… and to visit me. Incidentally, the Wescotts provide excellent accommodations to their house guests, and would NEVER put a whoopee cushion in someone’s pillow case. Never. She will be speaking tonight at the Hendersonville First United Methodist Church at 6:30 pm, AND reading/signing copies of her book tomorrow night at Parnassus Books in Green Hills. Details below. 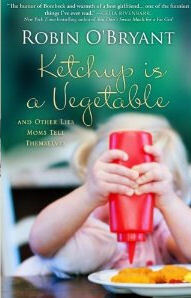 Her book, Ketchup is a Vegetable: And Other Lies Moms Tell Themselves, is available for sale on Amazon. It has been rated #1 by reader reviews in two genres- Humor Essays and Parenting & Families. WARNING: You may wet your pants with laughter while reading it. This is a can’t miss event! Please bring a friend, and get ready to laugh till you cry (or pee) about the journey we call mommyhood! They will be in the Genesis Hall to allow for more people. Very cool for you, Lori! Y’all have fun – sounds like you already are!